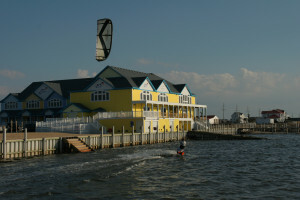 After opening the Kitty Hawk Kites Kiteboarding Resort in Waves, NC last fall, Kitty Hawk Kites is planning to host the inaugural kiteboarding race, beginning April 25 and continuing through May 2. Kitty Hawk Kites and KiteUS are co-sponsoring this week long event and are expecting a large number of participants. Kiteboarders from across the country will be in attendance to compete on Hatteras Island, one of the best locations in the country for kiteboarding. The races will begin on Sunday, April 26, and continue through the following Saturday. Spectators are encouraged to come out and view the course races throughout the week at the Kitty Hawk Kites store in Waves. Races will take place on the Pamlico Sound, directly behind Kitty Hawk Kites. The daily course races will be divided based on skill level. The levels set for these races include expert, intermediate, amateur, and women. Points, awarded by the panel of judges, will be given for the top three riders in each race. Each race will host six to ten riders and last between 20-30 minutes. The races scheduled each day will be based on wind speed and direction. A “day winner” will be determined each afternoon by the judges. To register for this event, visit www.kiteus.com/racing. Participants must register, either in advance or at the Kitty Hawk Kites Kiteboarding Resort during the week of the event, to be added to the roster. Participating kiteboarders and spectators are encouraged to register to receive the latest information regarding the first annual Kitty Hawk Kites Kiteboarding Race. Registration is free, thanks in part to our sponsors: KiteUS and Monster Energy Drink. For more information regarding this event, visit www.kittyhawk.com or contact Cydney Palmer, event and public relations coordinator, at (252) 441-4124 x204.